Always wanted to open a barbecue restaurant? Talk to Ed Mitchell first. 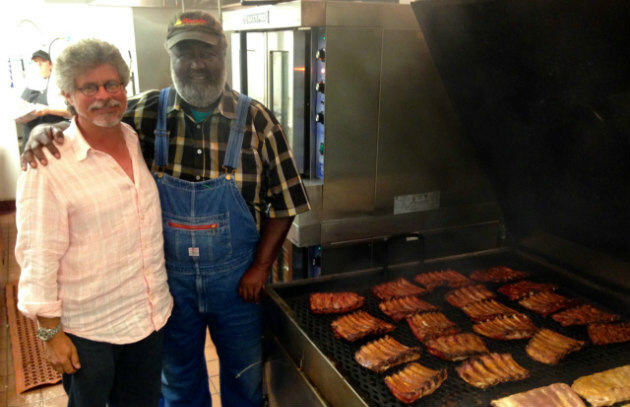 Mitchell has opened—and closed—some of the most celebrated barbecue joints in North Carolina. His latest venture was a slick neon and glass restaurant with a designer bar next to Bull Durham Stadium—about as different as his previous establishment—a cinderblock joint called The Pit. But whatever the vicissitudes of the business, one taste of Mitchell’s pulled pork—the meat moist, the smoke scent subtle but unmistakable, the vinegar sauce peppery-sharp enough to make you sit up and take notice, but not so fierce as to make you sweat—lets you know you’re eating the real deal. In a state where depressingly few barbecue joints still burn hardwood, Ed not only uses hickory and oak logs, but soaks them in vinegar for extra flavor. 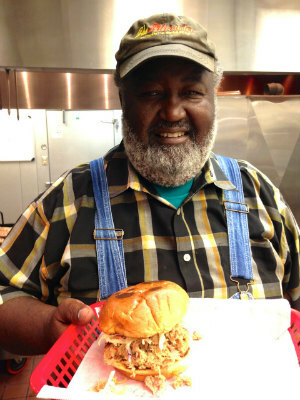 He even goes to the trouble of serving his pork sandwiches on house-baked buns (crusty where the buttered side hit the griddle, but Charmin-soft in the center), with additional crunch supplied by a fried pork rind. 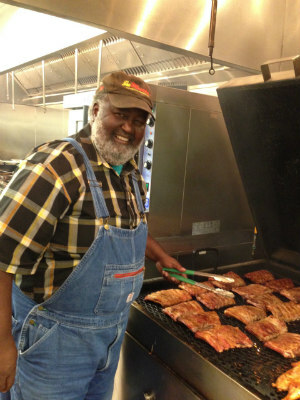 Mitchell was 67 years old when I did this interview and he looked the part of the Carolina pit master he cultivates, from his grizzled beard to his bib overalls. “I wanted to bring back the foods and flavors I remember as a kid,” he says. That means smoking a whole 225-pound hog to make that pulled pork sandwich, “because you need meat from the shoulder, from the ham, and from the belly,” Ed says. “I don’t want people to misjudge the restaurant: just because it looked nice, doesn’t mean we don’t cook authentic.” To make sure you knew that, he installed a closed circuit television, so you could watch Ed’s ribs, brisket, and miraculous whole hogs come off the wood-burning stainless steel pit that Ed designed himself. I’m the odd bird out. Most guys cook low and slow. I cook hot and fast. I build a seriously hot fire and bank the coals around the hog. Then I close all the vents and let it cook overnight. 500 degrees to start with. I gradually bring the temperature down to 250 degrees. I use charcoal briquettes as a base, adding 60 percent oak logs and 40 percent hickory logs for smoke flavor. I “season” the logs in a tub of water flavored with vinegar, onions, and garlic. What’s in your rub/barbecue sauce? The usual: salt, black pepper, red pepper, and garlic and onion powder in the rub. Cider vinegar, crushed red pepper, salt, sugar and black pepper in the sauce. I’m not trying to reinvent the wheel. What are your favorite foods to smoke? Whole hog. Ribs. Brisket. Chicken. But one of my favorite dishes at the restaurant (the author’s too) isn’t smoked at all: it’s our stewed tomato and cheddar cheese pie. We make it just like my mother did when I was growing up. What’s your advice for the guy or gal starting out at home? Your barbecue is only as good as the meat you start with. Here at Ed Mitchell’s Que we use Duroc hogs (a heritage breed) raised by farmers we know in the area. A 225-pound hog will serve 150 to 175 people. Figure on 4 to 6 ounces of meat per person. When you barbecue chicken, start with the skin up (so the melting fat bastes the meat). After 45 minutes, cook it skin side down to finish rendering the fat. The best beverage to serve with barbecue? Bourbon is what we serve our customers. Moonshine is what we drink when manning the pit. We never open Christmas or Thanksgiving. That’s the day you’re supposed to eat family food. GET A RECIPE FOR NORTH CAROLINA PULLED PORK.